An excerpt from the movie "The ShawshankRedemption" that captures the essence of our feelings. Thanks to Richard for sending this in. An electronic collection of photos of Andy. Most photos are from the last few years, however we have recently added some photos from Andy's childhood which Ms. McCoy graciously provided. A message board for everyone and anyone to post their thoughts, memories, stories, tributes, or thoughts about Andy. Please take a look if you'd like to know Andy a little better, and consider leaving a memory behind so that we can share in your remembrance. The circumstances of Andy's death were featured on TechTV's Cybercrime. Here are two encodings of the show. It seems the people at the Darwin Awards thought it appropriate to award Andy a Darwin Award (removed as of May 1, 2:55 AM, possibly earlier). Google's cached version here, local mirror here. Thank you to whomever discovered this, and asked The Darwin Awards to remove the page. I only link/mirror it for record keeping. Amccoy.org is now under new ownership. Hopefully it can be co-adminstered by myself, (Richard) and Justin (previous owner). Please note that all email addresses on amccoy.org still do not work. If you find any problems with any of the dynamic parts of the website, e.g. message boards, photo album, please email amccoy.org@richardharman.com. Unfortunately the link to the article below is now broken. The Roanoke Times archives their news after a few days. I'm currently waiting for permission to reprint the article since it is copyrighted. If you would like to read it, there is a $1.95 charge which you can pay by credit card to view the article. I was informed today that the merchant who sold nitrous oxide to unauthorized customers has been indicted. The story is somewhat graphic, but I did not want to withold any information. Please use discretion. You can read the story at the Roanoke Times. Welcome to the Andy McCoy Memorial. A small group of us got the idea to gather our collective stories, memories, and pictures of Andy together to help us through this. In true computer geek fashion, we couldn't think of a better way to do so than through a website. So, we have established this website for everyone to join together in remembering and honoring Andy. Please contribute anything you'd like, and feel free to contact anyone of us. If you have a suggestion for an additional section of the memorial, please email amccoy@richardharman.com. 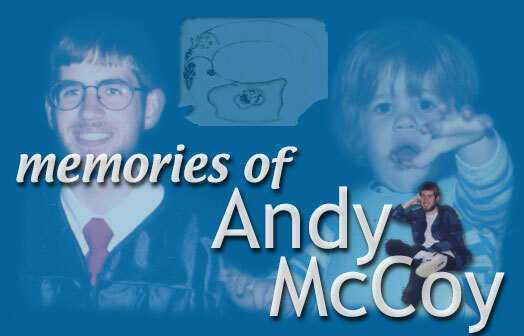 The Andy McCoy Memorial site was established in November, 1999 as a tribute to a wonderful person and friend.